Marshwood's Bradley Beaulieu wins his division for the fourth time, and three other Mainers capture titles. SANFORD — Marshwood High senior Bradley Beaulieu met expectations. Three other Maine wrestlers exceeded their calculations, joining Beaulieu as weight-class champions in the two-day Spartan Wrestling Tournament, which concluded Saturday at Sanford High School. Leo Amabile of Massabesic watches the referee's count after pinning Ben Leblanc of Danbury, Connecticut in the 113-pound final. Amabile won in overtime and was chosen as the meet's Most Outstanding Wrestler. 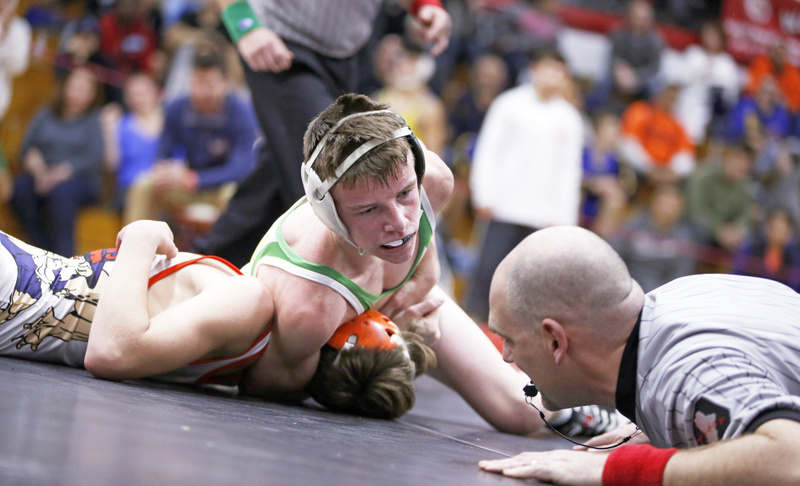 Beaulieu won his fourth Spartan title, taking the 138-pound class. Coming off his victory at the Lowell Invitational in Massachusetts, which included his 200th career victory in the semifinal round, Beaulieu said he didn’t feel extra pressure as a heavy favorite. Leo Amabile of Massabesic (113 pounds), Jordan Lang of Camden Hills (132) and Matt Caverly of Marshwood (152) were first-time winners at the tournament, considered the toughest in Maine. Timberlane Regional of Plaistow, New Hampshire, dominated the team competition. The Owls had nine finalists – the same as all Maine teams combined – and five champions while scoring 321 points. Danbury, Connecticut, was second with 222 points. Marshwood placed third with 188 points and was the only Maine team in the top five. Beaulieu, wrestling more aggressively this season, is unbeaten so far and claimed his 206th career win with a 6-0 decision over Cody Lewis of Timberlane in the final. He will soon pass former teammate Cody Hughes as Maine’s all-time wins leader. Amabile, a senior, earned Most Outstanding Wrestling honors. Amabile pinned all four of his opponents, including an overtime putdown of Ben Leblanc of Danbury, Connecticut, to break a 0-0 tie in the final. Lang pinned all of his opponents in the first period, and none recorded a point. 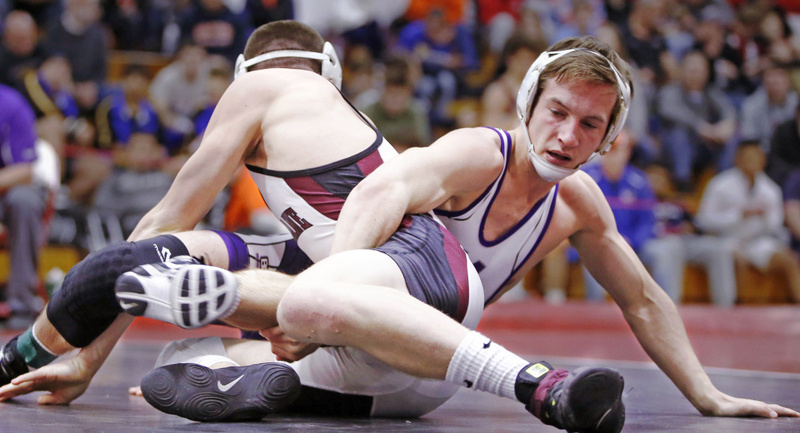 Caverly, a senior, was wrestling at 152 pounds for the first time this season. As a junior, he wrestled at 126. Since then, Caverly has grown six inches, and he started the season at 160 pounds. Mainers who placed second were the Mountain Valley duo of Caleb Austin (126) and Eddie DeRoche (145), Sanford’s Sam Anderson (160), Belfast’s Jacob Waterman (182) and Massabesic’s Noah Schneider (195). Anderson lost for the first time this season when he was pinned by Ryan Devivo of Xavier High from Middletown, Connecticut.